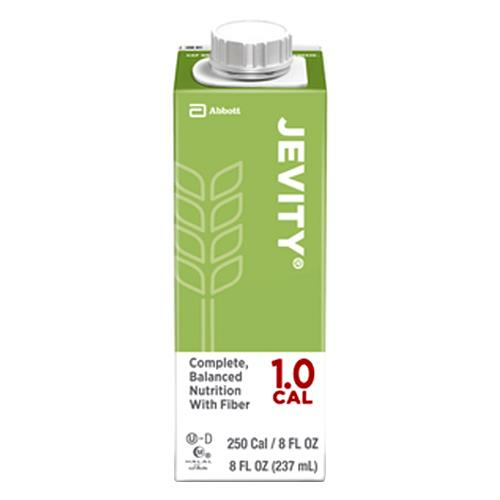 Abbott Jevity 1 Cal Complete Balanced Nutrition with Fiber is a fiber-fortified tube-feeding formula. May be used for oral feeding of patients with altered taste perception. 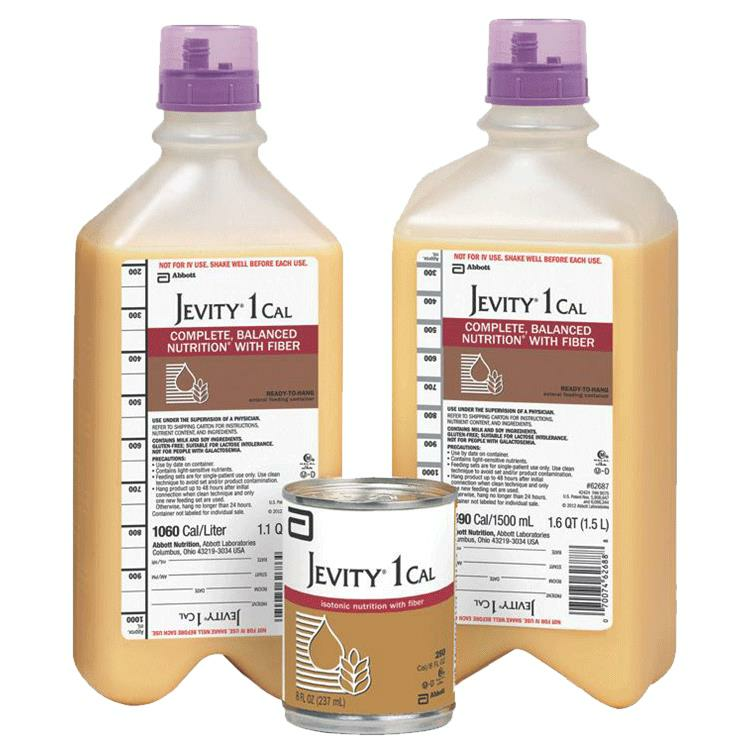 It provides protein to help support lean body mass and wound healing and isotonic formula is beneficial for those intolerant of hyperosmolar feedings. It is basically for supplemental or sole-source nutrition. 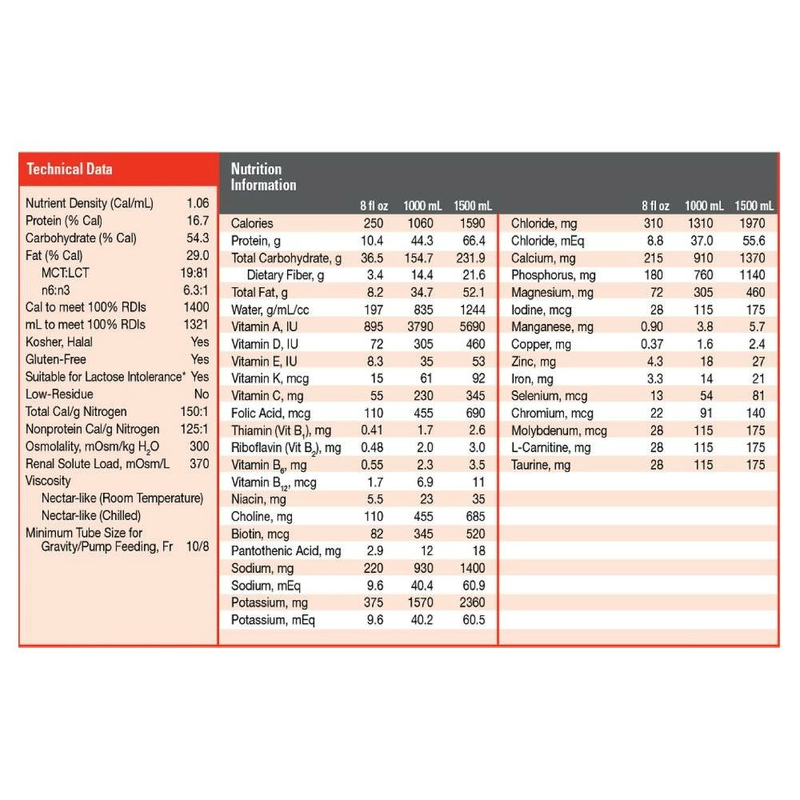 - Water, Corn Maltodextrin, Corn Syrup Solids, Sodium & Calcium Caseinates, Soy Fiber, Soy Protein Isolate, Canola Oil, Corn Oil, Medium-Chain Triglycerides, Calcium Phosphate, Potassium Citrate, Magnesium Chloride, Soy Lecithin, Sodium Citrate, Ascorbic Acid, Choline Chloride, Magnesium Phosphate, Potassium Chloride, Carrageenan, Taurine, L-Carnitine, Zinc Sulfate, dl-Alpha-Tocopheryl Acetate, Ferrous Sulfate, Niacinamide, Calcium Pantothenate, Manganese Sulfate, Cupric Sulfate, Thiamine Chloride Hydrochloride, Pyridoxine Hydrochloride, Riboflavin, Vitamin A Palmitate, Folic Acid, Biotin, Chromium Chloride, Sodium Molybdate, Potassium Iodide, Sodium Selenate, Phylloquinone, Cyanocobalamin, and Vitamin D3. - Contains milk and soy ingredients. - Store unopened at room temperature, avoid extreme temperatures. - Jevity 1.0 is ready to use. - Clean top of container thoroughly before opening. - Once opened, cover, refrigerate and use within 48 hours. Note: Failure to follow the Instructions for Use increases the potential for microbial contamination and may reduce hang time. - Pump feeding is recommended, use an 8Fr or larger tube. If gravity feeding use a 10Fr or larger tube. - Administer product at room temperature. - Thoroughly wash hands with soap and water before handling container or feeding set. - Turn container upside down and Shake vigorously, using a twisting motion for at least 10 seconds. - Do not touch any part of the container or feeding set that comes into contact with the formula. - Visually inspect foil for signs of leakage. Do not use if leakage is apparent. - When initiating feeding, follow physician;s instructions. Adjust flow rate and volume according to patient;s condition and tolerance. - Additional fluid requirements should be met by giving water between or after feedings or when flushing the tube. - Follow Directions for Use provided with Abbott feeding set. 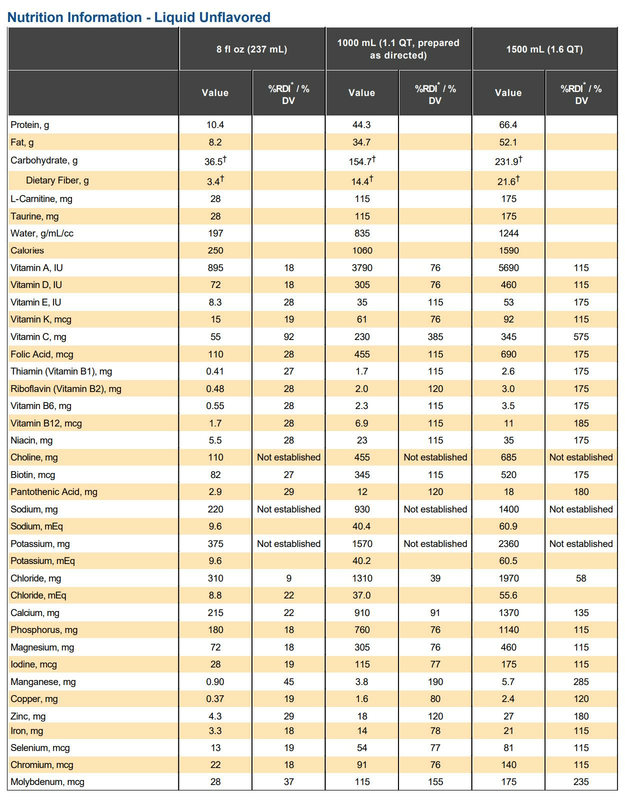 - May by used for total or supplemental nutrition. - May be fed at room temperature or chilled. - Adjust flow rate and volume according to patients condition and tolerance. - Feed at room temperature. - Pump feeding is recommended; use an 8 Fr or larger tube. For gravity feeding use a 10 Fr or larger tube. - Avoid contamination during preparation and use.